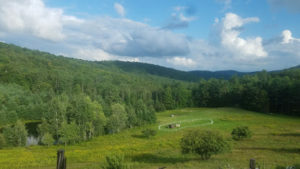 During the middle of August, I had the pleasure to step away from Surface Design Association for 2 weeks and attend an artist residency in rural Vermont: Lazuil Residency. 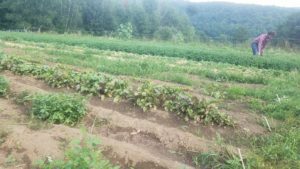 Lazuli is a summer-based residency on 125 acres of field and forest, where most of the food is grown and prepared themselves. They offer up space in their studios and workshops in order to host a diverse group of artists in an effort to support underserved populations. Facilities include a wood shop, ceramics shed, metal shop, fiber barn, and shared indoor and outdoor studio spaces. 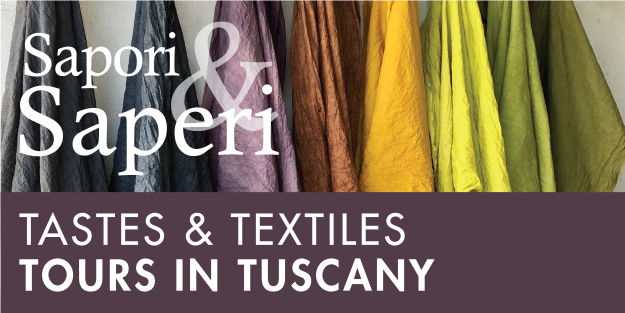 Lazuli Residency, 2018. Photo: Lauren Sinner. Being based in Portland, OR, and having to hold many jobs to get by means I don’t have as much studio time and solitude as I would like, so being able to take 2 weeks totally off and focus on me was a huge treat. Room / Studio view, Lazuli Residency, 2018. Photo: Lauren Sinner. The beginning days were overwhelmingly calm, in a good way. There were no meetings to attend, no articles to write, and no one needing me besides myself. My time was totally open, besides scheduled meals (which you could also go out on your own) at 8am, 1pm, and 7pm. I found myself almost paralyzed with the openness and lack of responsibility. So for the first few days, I sat, read, breathed, and finally began sketching at the end of day 2. These sketches eventually turned into embroideries, which were then sewn together to create a small sketch for an upcoming project I’m working on. 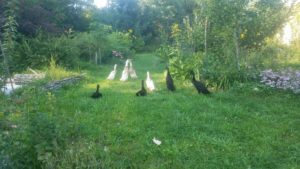 Ducks that live on the property, Lazuli Residency, 2018. Photo: Lauren Sinner. Lauren Sinner Growth 2018, commercial cotton fabric, India ink, embroidery floss, sewn, 15″ x 15″. Photo: Lauren Sinner. Brief (optional) activities were also interspersed within studio time, like visits to local thrift shops, a tea farm tour, and a visit to the local library to see a granite calliope performance. For me, a really important element to artist residencies is being able to go out and experience a new place that’s not your home–getting to meet new people, see new sights, and have conversations you typically wouldn’t have. 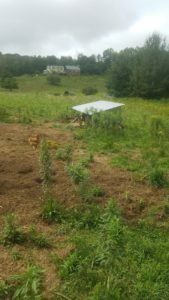 Free Verse Tea Farm tour from Misha Johnson, farmland, 2018. Photo: Lauren Sinner. 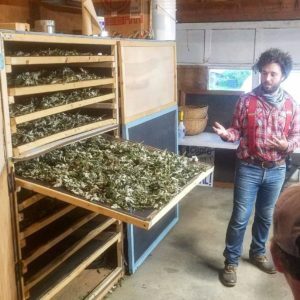 Free Verse Tea Farm tour from Misha Johnson, plant dehydration area, 2018. Photo: Lauren Sinner. 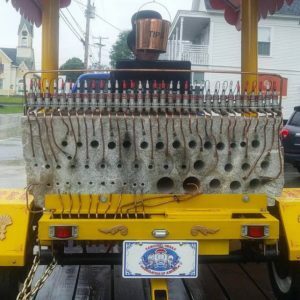 Granite Calliope, 2018. Photo: Lauren Sinner. One highlight from the residency was the accidental collaboration with a fellow resident (and musician), Greg Flores. We were both working in the studio barn on our respective projects–he an album, and me quilt–when we realized that the sounds of the synthesized music he was creating and the colors and forms of the quilt blocks I was creating were informing each other. 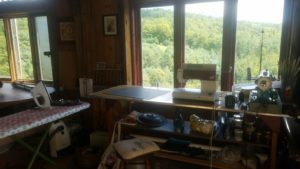 Studio, Lazuli Residency, 2018. Photo: Lauren Sinner. 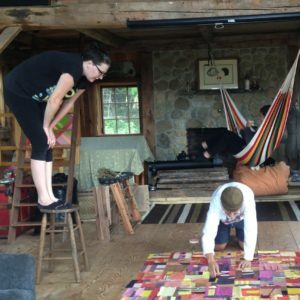 Lauren Sinner and Greg Flores arranging quilt squares, 2018. Photo: Kenya Lazuli. Collaborative quilt top between Lauren Sinner and Greg Flores. Photo: Greg Flores. Lazuli houses 7 residents at a time, all working in a wide range of media and from all over the country. 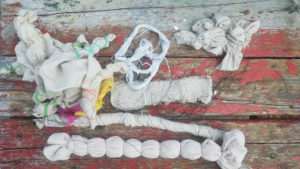 During my time there, there was a printmaker/drawer, a painter, a screenwriter, a musician, and a collaborative duo who creates mixed-media sculptures. Despite being from all over the country and working in vastly different fields, we all got along really well and even some dyeing together. The Lazuli property is home to many natural dye plants, but we chose to experiment with osage orange wood chips. Dyestuffs ready to be dyed, 2018. Photo: Lauren Sinner. 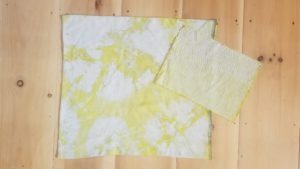 Osage orange on linen natural dye samples, Lazuli Residency. Photo: Lauren Sinner. Lazuli is a very self-driven and open residency opportunity, with very little scheduled events. There was one day, however, that was highly recommended we all go out together, and that was to attend Bread and Puppet Theater in Glover, Vermont. 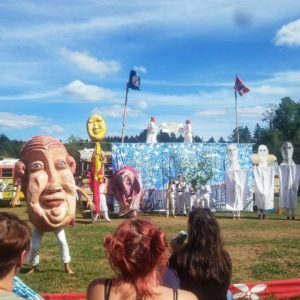 Bread and Puppet’s shows range from tightly composed theater pieces presented by members of the company, to extensive outdoor pageants which require the participation of many volunteers. 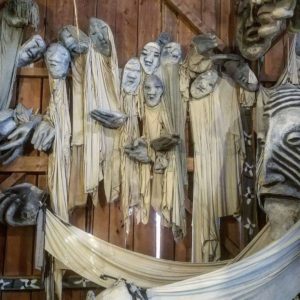 It is one of the oldest, nonprofit, self-supporting theatrical companies in the country, with a nearby barn that acts as an archive and museum for puppets, sets, and props from the past 40 years. Bread and Puppet Theater, 2018. Photo: Lauren Sinner. Bread and Puppet Museum entrance, 2018. Photo: Lauren Sinner. 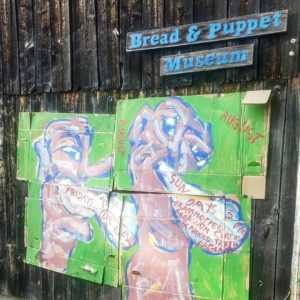 Bread and Puppet Museum, 2018. Photo: Lauren Sinner. My time at Lazuli Residency was one I will never forget. It gave me the time to focus on what’s most important to me, prioritize my commitments, and learn to take time to breath more often in my city life. I cannot recommend any harder for all artists to find a way to step out of their day-to-day lives and try a residency. Whether it’s one week or a full year, residencies are help put your artistic practice into perspective. Make sure to keep an eye for 2019 Lazuli Residency Application very soon! 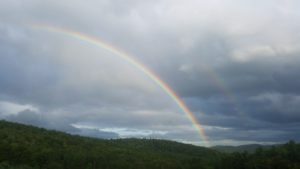 Double Rainbow, Lazuli Residency, 2018. Photo: Lauren Sinner. Have your own residency experience you’d like to share? Contact Lauren Sinner at managingeditor@surfacedesign.org to find out how to get your story in the Journal or Blog. Are you an SDA member and need help funding an artist residency or professional project? Check out SDA’s Awards & Grants page. We could help fund your experience! 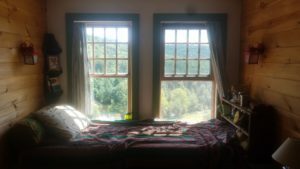 What a delightful BLOG about your Residency in VT this past summer. 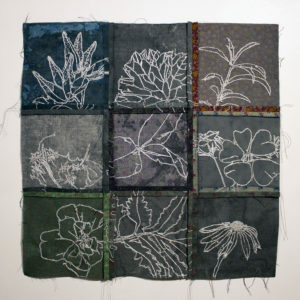 I enjoy seeing the finished textile project and perhaps hearing more about your studio in the barn.